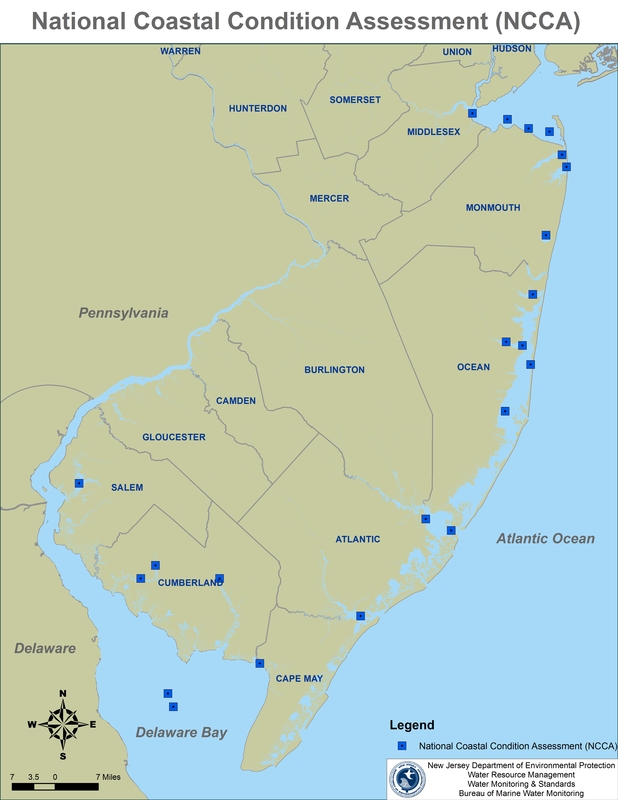 The Coastal Water Quality Network (CWQN) was established in 1989 to provide water quality information for assessing the ecological health of New Jersey's coastal waters. Approximately 40 sites are visited 5-10 times per year. Samples are analyzed for: Alkalinity, Biogenic Silica, Chlorophyll ‘a’, Dissolved Oxygen, Enterococcus, Ammonia, Nitrite, Non Purgeable Organic Carbon, pH, Orthophosphate, Salinity, Total Nitrogen, Total Phosphorus, Total Suspended Solids, and Turbidity. This long-term monitoring program is intended to provide environmental managers, researchers and the public with accurate, timely and comprehensive information about the condition of the State's ocean, estuaries, and tidal rivers. Maintaining ecosystem health is consistent with our obligations under the Environmental Protection Agency's (EPA) Clean Water Act to maintain aquatic life uses. 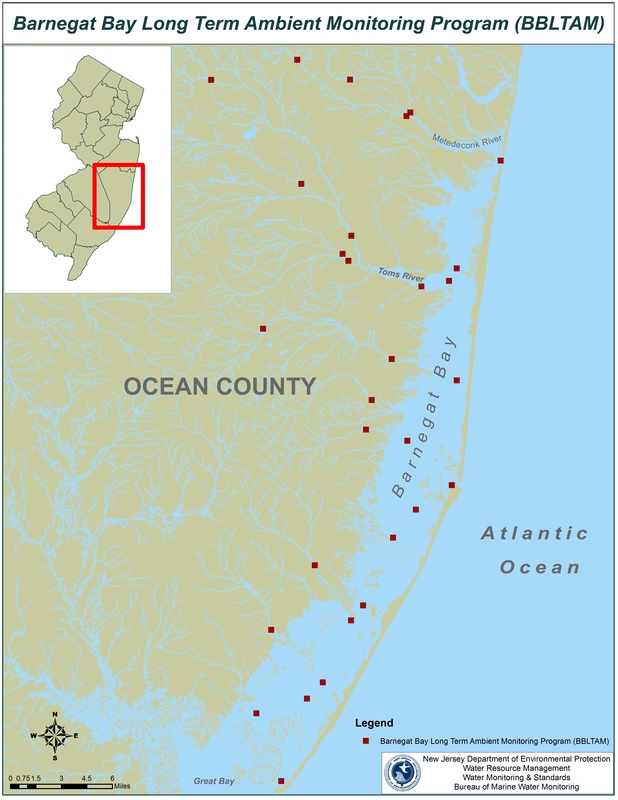 Currently, ecological assessment of New Jersey's coastal waters is achieved by evaluating indicators of eutrophic condition through; nutrients, dissolved oxygen, chlorophyll a, and secchi depth. 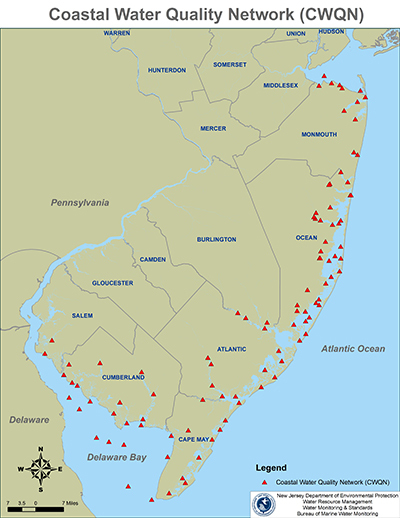 Data generated by this network is assessed and reported in the latest version of the New Jersey Integrated Water Quality Assessment Report as well as in summary reports available from the NJDEP Bureau of Marine Water Monitoring. Provide a more comprehensive assessment of the relevant water quality conditions throughout the Barnegat Bay both spatially and temporally. Provide water quality and biomass data to better quantify biological productivity and its impact on dissolved oxygen concentrations in the bay. Estimate the nutrient loadings into the bay and establish boundary conditions for the significant tributaries to the bay. Provide nutrient concentration and loading data needed to evaluate the effects of nutrient load reduction scenarios. Provide an understanding of the physical factors affecting the bay water quality; such as the flushing rate, temperature, salinity and the depth of the bay. These factors play a major role in the physical, chemical and biological processes operating within the bay. Collect data that captured daily and seasonal variability as well as variability between years. Collect sufficient data (minimum 24 months) to develop water quality and hydrodynamics models. Calibrate and validate modeling tools that can be used to direct water quality restoration of the bay. To accomplish these objectives, BMWM collects approximately 30 water quality samples about 20 times per year. These samples are analyzed for: Alkalinity, Biogenic Silica, Chlorophyll �a�, Dissolved Nitrogen, Dissolved Ammonia, Dissolved Nitrite, Dissolved Organic Carbon, Dissolved Phosphorus, Dissolved Orthophosphate, Enterococcus, Ammonia, Nitrite, Non Purgeable Organic Carbon, Orthophosphate, Total Nitrogen, Total Phosphorus and Total Suspended Solids. Nutrient analysis for these samples are analyzed and the results are stored and maintained throughout bureau databases. In addition, BMWM also supports and manages real-time monitoring buoys that record Dissolved Oxygen, Temperature, Salinity, pH, Turbidity, and Chlorophyll every 15 minutes, 24 hours a day. NJDEP staff take this information and perform water quality and nutrient loading assessments that are the foundation for model development. 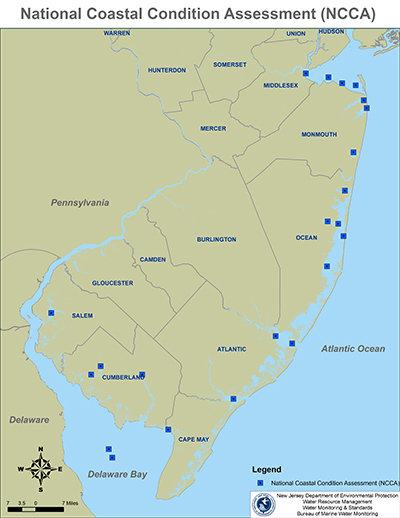 For more information on the Barnegat Bay, click here. To download the Barnegat Bay QAPP, click here. National Coastal Condition Assessment (NCCA) is a federally funded program managed by the Environmental Protection Agency (EPA) to assess the ecological condition of the nation's estuarine resources. 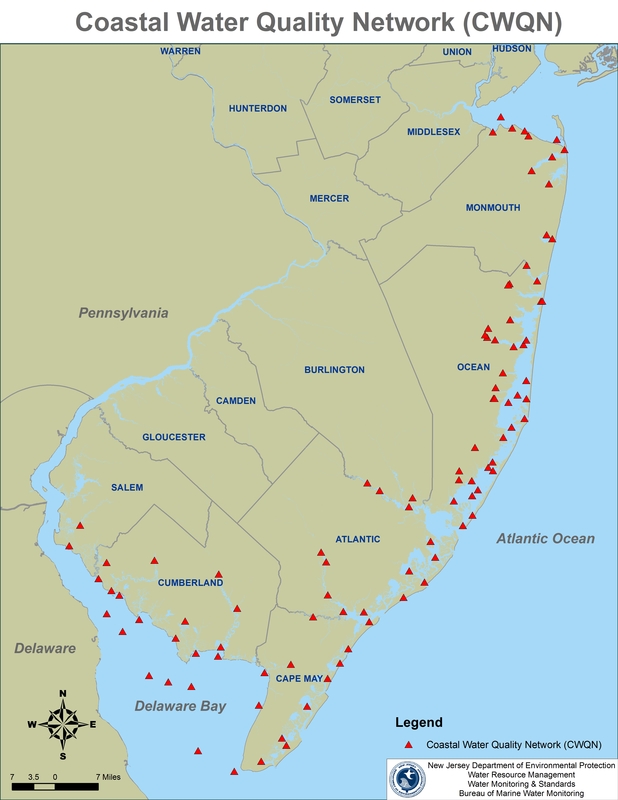 Starting in 2000, NCCA's annual summer sampling included collection of water, sediment, and benthic invertebrate samples in NJ's coastal bays. Through this program, samples are analyzed for water chemistry (e.g., nutrients, dissolved oxygen), sediment chemistry/toxics, sediment toxicity and benthic diversity. NJDEP has been assisting EPA in collecting data necessary for the development of a benthic index. Through this effort, the data is being analyzed to determine which indicators of benthic community are most appropriate for ocean waters off the coast of NJ. Results are used by NJDEP to assess ecosystem impairment of the NY/NJ Harbor in NJ's Integrated Water Quality Assessment Report. Through a collaborative effort between EPA, NJDEP and Rutgers University, research is currently underway in New Jersey to expand NCCA's assessment to the state's near-shore ocean waters. The design of the NCCA program is probabilistic, which means that it can be used to estimate what percentage of the state's or nation's waters are in good, fair or poor condition.